The stench was nearly unbearable but the words ringing loudly in her consciousness steeled her resolve in a way she was unable to fully understand. She couldn’t deny that this place was not at all what she had envisioned. Perhaps a spot under a tree with a portable tent. Or maybe a simple 10 x 10 makeshift structure that a slum family had once called home. Even a corner of the large public area in the center of the slum would have been better suited for the intended purpose. But the New Delhi city official responsible for the slum settlement had authority only to grant her access to this foul and filthy space: the open area between the male and female restrooms that served thousands of slum residents. This veranda-like space had another purpose: it functioned as an overnight refuge for some of the city’s homeless population, a group even more destitute than the multitude of families living literally on top of each other in the surrounding slum. By the time morning came each day, the concrete surface of this area was covered with human urine and feces. Making this squalid setting utterly unbearable were the dank, putrid odors emanating from the massively undersized and ill-plumbed toilets that stood along each side of this tennis court sized area. But the quiet, petite, young woman who held a Ph.D. in linguistics and served as a university professor continued on her knees the back-breaking work of scrubbing this filthy surface. She wanted it clean and tidy for her students, young slum children who would soon begin to arrive to receive today’s lessons. This environment was drastically different than the neighborhood where Ananthi and her husband, Emil, lived. Although only a short distance from the slum, their air-conditioned multi-room flat was spacious, secure and situated in an appealing neighborhood. The Jebasingh’s enjoyed all the modern amenities: washer, dryer, separate bathroom with running hot water and even a garage. How did this highly educated, well-placed woman end up in this place? The answer is simple: she was following the instructions and example of the God she worships. Ananthi would eventually give up her respected position as a university professor and devote herself full-time to educating the children in the Alakananda slum. She would go on teaching in the toilet complex for more than a dozen years before the slum was demolished by the government. Following the demolition, the school moved to a temporary location and continued to grow. Within a few years, God would miraculously provide a beautiful new facility. 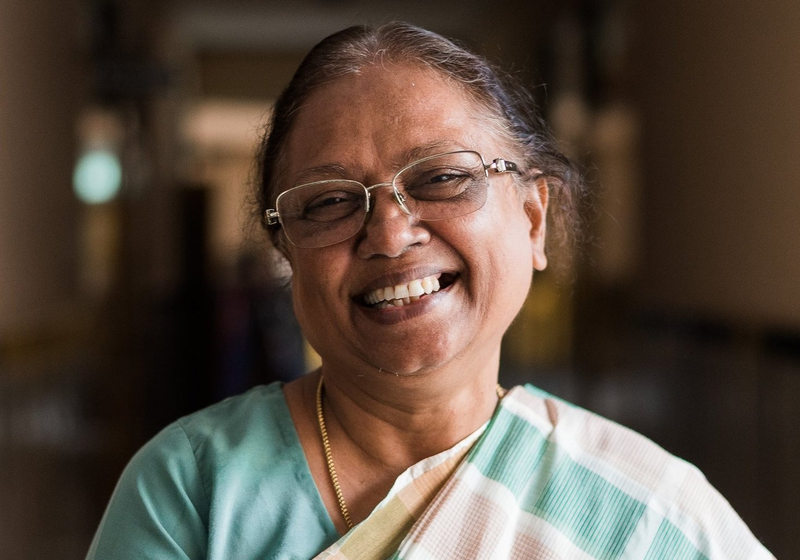 Today, Ananthi serves as the Founder and Manager of the Good Samaritan School with four campuses serving more than 2,500 students. I would highly encourage you to hear Ananthi’s full story by watching the video below or reading a recent interview here. Our family first met Ananthi nearly 15 years ago when she visited Lexington. Since that visit she has been in our home multiple times while travelling in the US. If you are a regular reader of my blog, you know from a recent post that our family has also made several trips to New Delhi to see first hand the unbelieveable work of the Good Samaritan School. You can find out more about the school at the Friends of the Good Samaritan website. When I first heard Ananthi’s story, my mind immediately went to Philippians 2, the scripture I used in my Christmas blog last week. I like to say Christmas comes every day at the Good Samaritan School. For Christmas is the celebration of Jesus becoming human – of Emmanuel, God with us – of God taking on human flesh – and coming to dwell with us. Everyday at the Good Samaritan School, Jesus takes on flesh in the form of teachers, administrators, staff and volunteers who come into the children’s world and are there to offer the children hope and a way out of the difficult environment of the slum. Of course the teachers and staff are only following the example of their leader, Dr. Ananthi Jebasingh. The first time I visited the school, I was a little taken back by the degree of deference shown by the teachers and staff to Ananthi. Anytime Ananthi walked into a room, conversations gradually ceased as the awareness of her presence spread across the room. And every person in the room stood up and remained standing until Ananthi insisted that they return to their seats. It seemed a little excessive. But as I interacted with teachers, staff and students, I learned that this deference was certainly not something Ananthi expected or required. Rather, it was a concrete expression of a deep respect for this humble and beloved leader. You see the teachers were exalting Ananthi in the same way that Philippians 2 states that God will exalt Jesus as a reward for emptying of himself and becoming an obedient servant.